Neutral tones, wood, and leather create a masculine vibe in a once feminine space. When the homeowner, a bachelor, purchased this South End condo, it had been owned by a single woman. 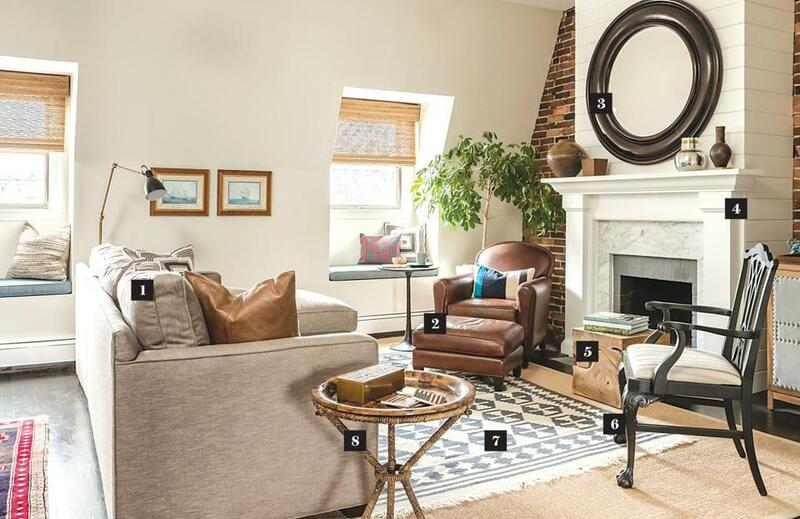 “There were lots of feminine touches: cool colors and patterns that didn’t appeal to the owner’s style at all,” says interior designer Meghan Shadrick, who worked to infuse the space with a more masculine, traditional vibe. Shadrick’s redesign mixes antiques, transitional furnishings, and mid-century pieces. “The goal was to make the space feel relaxed and comfortable as well as hip — but not overly modern,” she says. The main living area is awash with neutral tones and classic textures, including dark wood and leather. Ironically, the aesthetic Shadrick created may not last long. The owner is planning to get engaged, so “it’s probably only a matter of time before feminine flair creeps back into the home,” she says. 1. A compact Crate & Barrel sectional in taupe suits the space perfectly. Leather throw pillows add texture. 2. A Crate & Barrel leather armchair recalls a Parisian cigar chair. “The chair is supposed to feel like a vintage piece — it’s very deep and so soft. It’s also narrow, so it saves on space,” says Shadrick. 3. A large antique mirror with a hefty wood frame anchors the room. 4. The fireplace felt stark, so Shadrick had the sheetrock behind it clad with shiplap paneling to give it more presence. She also ordered a mantel from Mantels Direct that frames the existing marble surround. 6. A pair of wood chairs were antique finds on Craigslist that Shadrick had lacquered black; she had the seats reupholstered with an indoor/outdoor fabric. 7. The homeowner’s geometric-print rug was a little too small for the room, so Shadrick ordered a big sisal rug to layer underneath. 8. A round end table has a tortoiseshell top while the base is wrapped with rope. “It adds a nice mid-century element,” says Shadrick. 9. 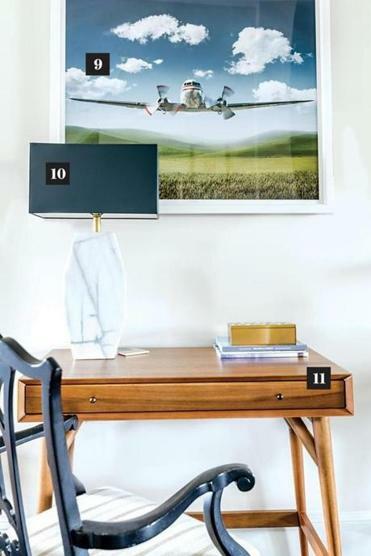 A photographic print of an airplane, ordered online from Trowbridge Gallery, resonates with the homeowner’s sense of adventure. 10. Shadrick discovered the marble lamp at The Collector in Somerville; the black shade was custom-ordered. 11. A sleek West Elm desk that has a mid-century appeal doubles as extra surface area when the homeowner entertains.